Erica Louise from Recycled Fashion shows off her pretty new dress. 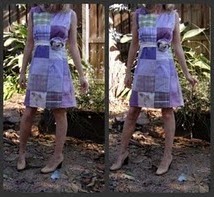 It’s a classic sheath dress made from a patchwork fabric. She made the patchwork from a set of upholstery samples. Because they all came from one set of samples, the colors and prints all coordinate nicely. Brilliant! And such a pretty dress! Read more about her project at Recycled Fashion.